Bow hunting whitetail deer is a sport that avid hunters would not trade for anything. Bow hunting presents unique challenges that some feel require much more skill than gun hunting. Many deer hunters do both bow and gun hunting so they get the best of both worlds, and an extended hunting season to look for that Monster Whitetail Deer. Bow seasons normally start before gun hunting season. In many areas the archery hunting season incorporates the height of the rutting season. Bow hunters often have incredible opportunities to down big bucks that only have mating on their mind. But the hunter still needs to know how to pattern the deer before the season starts, so he or she can place himself in the right area. Obviously you have to get closer to the intended target than you would if you were gun hunting. A hunter who patterns a white tail deer has learned all that is possible about the deer's movements before the season starts. The hunter may take pictures of sighted deer, follow tracks and locate feeding and bedding spots. 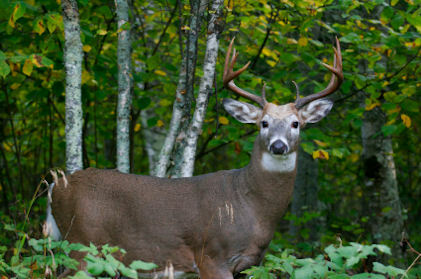 Information about a targeted buck is collected over a period of time and then organized into a picture of how the deer moves on a day-to-day basis. Some hunters collect very detailed information, including hoof size from tracks, length of stride and so on, in order to determine what size bucks are traveling an area. Bow hunters seeking white-tail deer must learn how to handle various wind directions. While patterning deer, it's also good to visit the hunting area in all kinds of weather conditions. During the fall, winds can be very inconsistent due to the changing air temperature. 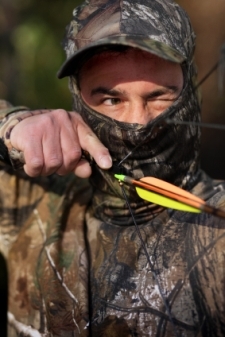 To compensate for the blowing winds, many bow hunters set up hunting stands at the edge of forest land or crop fields and pastures where the winds are more stable. There are hundreds of different brands of bows available for hunting. They include compound bows, crossbows, re curve bows, and longbows to name a few. Hunting bows are built to be quieter and lighter than sport archery bows, but learning how your bow and arrows will handle variable winds takes practice. While patterning your deer, you can also practice your shots. Whitetail deer hunting is a favored sport, indeed, but bow hunting whitetail deer is more like a passion for many hunters. The Buck We all hope for. The above picture is of what most of us would consider a Monster Whitetail Deer. To harvest such a Whitetail takes a lot of work in the field before the season and during the season. One of the keys to a great hunting season is to find where a buck like the one below hides. 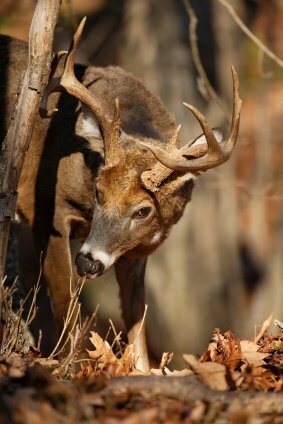 Learn his pattern during the rut and bring him home.